'If important why wasn't it filed a year ago?" attorney asks state attorney on indictment a week before elections. 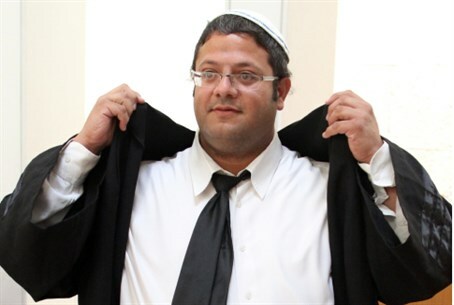 A decision by police to open an investigation into a two-year-old case against Otzma Yehudit candidate Baruch Marzel “stinks of election tampering,” says Itamar Ben-Gvir, who is representing Marzel in the issue. In a letter to the Attorney General, Ben-Gvir attacked the investigation, saying that it gave the appearance of election tampering – an impression, Ben-Gvir was sure, that the authorities in Israel would prefer to stay away from. The charges against Marzel, who is fourth of the Yachad - Ha'am Itanu joint list, stem from an alleged attack against a Palestinian Arab in 2013 according to media reports. The indictment alleges that on February 8 of that year, Marzel entered the home of Hevron resident Issa Amro as he was passing through to visit the Cave of Machpelah and began attacking the Arab resident for "unknown reasons" after Amro demanded he leave. Amro reportedly pushed Marzel out of his yard, attracting the attentions of soldiers. Marzel is said to have struck Amro's leg before being fully apprehended, allegedly causing permanent scarring. In response to the indictment, Marzel's press office said that the timing was too pat. "The timing the police select to file this indictment is amazing, proving our claims that the police are politically motivated and are looking to pursue and harass people on the right," he stated. "There are those who would do anything to harm my entrance to the Knesset, but in spite of this, I will be an MK, I will work for the people of Israel and the Land of Israel. "It's amazing [Balad] MK Hanin Zoabi has not yet been indicted for all of her grave acts," he added, referring to her direct collaboration with Hamas. "But on the other hand, they're trigger-happy with me."